The latest sales figures are available for the United States Mint’s numismatic products. The 2011 Commemorative Coins continue to be a focus, as the two most recent major product releases for this year. Other highlights include an interesting development for the Jane Pierce First Spouse Coins and the debut figures for a new America the Beautiful Quarters product. 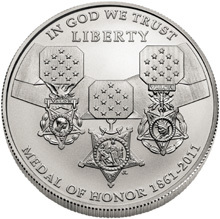 The 2011 Medal of Honor Commemorative Coins moved ahead this week, with numbers increasing by 65% or more for each individual offering. In last week’s report, it was noted that the debut figures only include two days worth of sales, explaining the relatively subdued start for the program. After this week, numbers are more in line with 2011 Army Commemorative Coin sales figures after a similar period. Sales for the Army program moved ahead at a relatively steady clip. Across proof and uncircualted versions, the $5 gold coins added 1,454, the silver dollars added 9,398, and the half dollars 5,375. Typically, US Mint products see a very dramatic slow down in sales after the rush of orders in the initial few weeks. In this case, sales may have been supported by the release of the Medal of Honor Coins. Some collectors may have opted to wait for this release, before placing orders for both programs. The proof version of the Jane Pierce First Spouse Gold Coin is now listed as sold out on the US Mint’s website. This is another somewhat unexpected sell out for the series. The maximum mintage had been set at 15,000 across both proof and uncirculated options, but as with the James Buchanan’s Liberty proof coin, the US Mint must have underestimated production needed to meet demand for the rest of the typical availability period. Initial sales figures for the Yosemite National Park Quarter Three Coin Set came in at 11,441. This product includes one uncirculated coin each from the Philadelphia and Denver Mints and one proof coin from the San Francisco Mint.